They don't make ships like that nowadays … It would cost all the money you have in the world — and a bit over. We all seem to want something different … let's leave it to the ship. 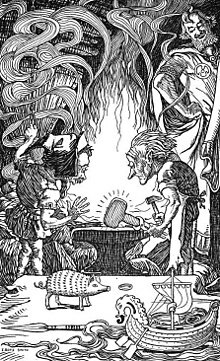 The Ship that Flew (1939) is an acclaimed children's fantasy novel by Hilda Lewis, which tells of some of the journeys of four children across the world and through ages of time in a magic ship, sold to the eldest of them by Odin in disguise, which they come to discover had belonged to the Norse god Frey, and was called Skidbladnir. The light deepened in broad bands. Suddenly the sun burst through, fierce and bright as after a storm. There was something so noble about the old man that the children knew, in spite of his simple tunic and broad-brimmed hat, that he must be a king at the very least. This thing is beyond your understanding, my child. Think no further on the matter and maybe you will read the riddle in the end. I am older than the stars. Thor wages unceasing fight against the giants, and will do so to the end of time. Frey must not seek his own, lest famine fall upon Asgard and the world of men starve. These are bad times. One day you live in peace in the house you have built for yourself, and the next, who knows, but the house is burnt about your head, and you wander forth, starving. Usertsen ordered that an inscription be made testifying to the truth of the story, and placed it in his coffin. He also ordered that it should be carved into the rock so that it would endure for all time. Odd isn't it? This is no time for anger … nor for any talk of punishment. First we must fight. Round and round went his thoughts. More than once, his plan almost complete, he would discover some detail that would endanger the whole thing. You have used it much … and you have used it well. You have forgotten … And you will forget still more! Whether all this really happened, not even Peter can say now. It all began with Peter's toothache. You wouldn't think anything really nice could come out of having a toothache, would you? Well, this time it did. Ch. 1 : The Magic Begins, first lines. It was a narrow little street and rather dark, with old houses set close together. Peter was rather surprised. He didn't remember this street, and what is more, he hadn't known there were any old houses in new little Radcliff-on-the-sea. "But then," he told himself sensibly, "I don't know everything!" "They don't make ships like that nowadays," he said, a little sadly. "Is it very old?" Peter asked, hoping that it wasn't, because very old things, he knew, often cost a good deal of money. The old man nodded. "Older than any one would believe." "All the money in the world wouldn't have bought this once… no not if it were prince nor king nor emperor himself." Peter didn't know what to say to this, so he said, "Could I buy it, do you think?" Then the old man said a strange thing. "It would cost all the money you have in the world — and a bit over." You don't believe me… Well I don't expect you to! I wouldn't myself unless I saw it with my own eyes. But I wish, I wish it would happen. I wish the ship would take us somewhere — anywhere! Humphrey said in a funny little voice, "It's a dream. I'm dreaming it. You've all come into my dream!" "My dream!" said Sandy in the kind of voice that means to go on arguing. "It isn't a dream," Peter said happily. "It's happening. And it's real." "No one sells a magic ship for three shillings,"' Peter said slowly. "And he was an old man — poor. He was blind in one eye, too. He couldn't see properly." I think you were meant to keep it Peter … I think that's part of the magic. From the garden came a dozen sweet smells. Sheila closed her eyes and wondered whether she could distinguish them. She was sure she could smell roses and night-scented stock. "We flew," said Peter, hoping the questions would now stop. We would not dream of telling you lies, sir, and we are grateful for all your kindness to us, really we are, but if we told you the truth you wouldn't believe it. It is true that no one had found either sapphires or diamonds or rubies on this particular stretch of beach, but that, Sandy was convinced, was because they hadn't looked hard enough. It is the best of ships. When her sails are hoisted a breeze springs up and carries her swift and safe to whatever place the gods choose. She is made of thousands of little pieces fitted together withs such cleverness that when she is not wanted Frey can fold her up and put her in his pocket. 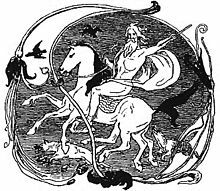 Description of the magic ship Skidbladnir, given to Frey by Odin. The light deepened in broad bands. Suddenly the sun burst through, fierce and bright as after a storm. The sky was clear and blue about them. Before them stood an old man, very tall and upright, carrying a staff as though it were a king's sceptre. There was something so noble about the old man that the children knew, in spite of his simple tunic and broad-brimmed hat, that he must be a king at the very least. This thing is beyond your understanding, my child. Think no further on the matter and maybe you will read the riddle in the end. Who knows? Meanwhile the air is fresh and the day golden and my palace is near at hand. The young should enjoy themselves while they may, so come! "Yes," she said, reading their thoughts, "it is a cloud. I spin the clouds into the finest linen for the gods to wear. I am the mother of the gods and I am called The Spinner in the Clouds." At last Sandy found her voice. "Who is the bravest warrior?" she asked. "They are all so brave that no man can say. But the greatest of them is my son, Thor. 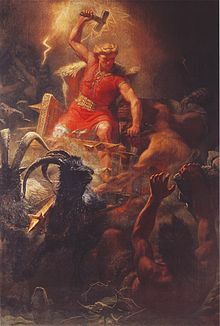 Thor wages unceasing fight against the giants, and will do so to the end of time." "There aren't any giants where we live," said Humphrey sadly. "Except at fairs and things, and they aren't real giants at all." "There are always giants," replied Odin, "and men must always fight against them." "I don't know what you mean," said Sandy, lifting a puzzled face. "I understand," said Sheila softly, "you mean fighting against the things that are wrong." Odin nodded. "Even children may fight that fight," he said. "Come!" Let these strangers tell us whence they have come, and why they have come, and how! To the Peace Stead, for this thing must be settled in friendship. I must never leave Asgard and my work of watching all growing things … Frey must not seek his own, lest famine fall upon Asgard and the world of men starve. Where did this child find so great a sum to purchase the ship Skidbladnir? There is no treasure in the whole world can buy it. Frey, it is very clear that Skidbladnir has passed out of your hands. It was yours and you lost it. Now it has come to this child by right of purchase, and it is his until he, of his own free will, shall give it up! Frey… men come and go. The years pass with them more swiftly than the flight of an arrow. But with the gods it is not so. Ages must pass, the sea may grow dry and the mountains crumble, but our hair is not less bright, nor our strength less, nor our wits more dim. The gods endure. Now let us strike a bargain. This child shall keep your ship until such a time as he no longer desires it, then he shall return it to you! What man is born who would not desire Skidbladnir? We'll forget … Being grown-up does that to you. On the day you send back Skidbladnir, I will grant each one his heart's desire. Guard my ship well. 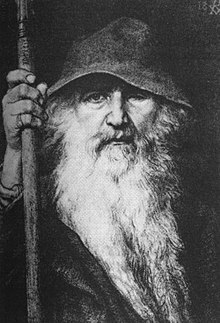 And now I will tell you a secret concerning Skidbladnir that no soul knows, save Father Odin and me. 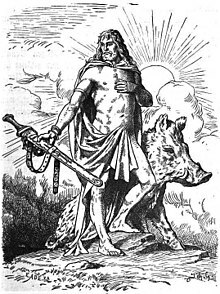 When you alight from the ship and set foot in a foreign land whose tongue you can neither speak nor understand, pass each one of you a hand over the boar's head and the secret of foreign speech shall be made clear. And more, you shall look like the dwellers in the land and no man shall know that you are strangers. And so, brother, farewell! You can't help troubles popping up now and then, even when you don't expect them. I mean, even if we stayed here on this spot without moving, something would happen! These days no man knows who may be his friend, nor who his enemy. Don't be silly … It isn't witchcraft at all. Just plain straightforward magic! The inscription keeps mentioning a ship — a flying ship. … Now if the ship had been the ordinary pattern of Egyptian ship, I shouldn't have thought twice about it. The ship of Osiris — that's one of their chief gods, or the Sunboat of Ra — that's another god — well you might expect that. But it isn't. It's something quite different. It's the kind of ship you find a couple of thousand years later in a very different kind of land. A dragon-ship, complete with square sails and gilt boar's head at the prow. The children stood speechless, staring at the picture of their own ship. It was a faithful picture, the colours bright and the shape true. It was just possible that the magic had run out, as Peter said. After all, you knew a lot less about magic than you did about an electric torch. This is no time for anger … nor for any talk of punishment. First we must fight. And when we return in victory, then I shall deal justly with the traitors. "I wonder what's really underneath that cloud?" asked Sandy. "I mean, if we could look through it, what would we see?" "The past, spread out like a map," Sheila answered. I had thought you were a dream, all of you. Or that you had forgotten me. And I do not know which thought I liked least. And now you are here at last! Nobody must know where it has come from. It is my secret … We must slip it in through the vicarage door when it is dark! She walked silent between the chattering children. This was their world, their own real world. But friendly and happy though it was, it wasn't her world. Hers was a world of cold stone castles and grim fighting; of hardship and courage. Of courage! She was suddenly impatient of this pleasant easy world of theirs, where life flowed so smoothly. She was so tired that it was almost as though she moved in a dream. Nothing seemed quite real any longer. I must live my life in my own way and in my own time. "Did you hear that? gasped Humphrey. "The villain in the greenwood!" "Who robs the rich," continued Sheila. "To give to the poor," finished Sandy. Peter clapped his hands together. 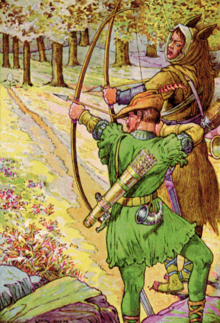 "Robin Hood!" he cried. At first Robin was too dumbfounded to think clearly, but soon the thought of his man in danger put all other ideas out of his head; he sat there, a hand pulling impatiently at his beard. Round and round went his thoughts. More than once, his plan almost complete, he would discover some detail that would endanger the whole thing. You must must make your way with all speed to the castle rock and take you stand upon the highest place, that is to the left hand as you face the river. There you must stand with the ship ready in hand, awaiting the signal. And having received the signal, you must not delay a second. You … shall give the signal. You must press as close to the stake as you dare … The signal must be plain to him who watches. Now do you understand right well the parts you must play? I will not hide from you lad … that of all the tasks, yours is the most perilous. But all will go well if you be steadfast and not lose your wits. Now listen. When you have played your part, you must walk slowly away, and in the confusion — for confusion there will certainly be — you may well escape. Whatever betide, you must not run, nor show any sign of haste; for a crowd that is cheated is swift upon the scent as any hound. And if by ill chance you be taken, then submit yourself, for I will come to your aid, I pledge my word. Now remember — the signal given, you must delay not an instant. It is a man's life you work for, and maybe your own and mine too! And so farewell and good luck go with us! That afternoon the four children went round to the potting-shed to make the acquaintance of the new gardener — after all, a lot of the fun you can have in the garden depends upon what sort of man the gardner is. Time was slipping away. The children were growing up little by little, even Sandy was quite big. And it was five years since Peter had seen the magic ship in the old dark window. And very good use they made of it, too. Backwards and forewords through history they went, until the story of their country became a living growing world to them. They went further back in time, till it seemed the time-cloud would never lift. They walked in the hanging gardens of Babylon, they watched beside Leonidas in the pass of Thermopylae, they stood with Horatius, when he kept the bridge, and stepped beside Hannibal over the frozen Alps when he marched for Rome. It was all so wonderful and so magical that sometimes they got a little confused by their adventures, so that their memories were like painted patterns that some one has left out in the rain. And sometimes they began to wonder if it was really true — all of them except Peter, who had no doubts whatsoever. And then Peter began to wonder what would happen if he, too, grew like the others and didn't believe. His boat, is own little boat, would be neglected and forgotten. And the magic would work no longer — for when you no longer believe, then the magic stops. Suddenly Peter knew what he must do. He must return the boat before he grew like the others. He must find the little dark shop and give back the flying-boat before it was too late. "You have forgotten," said the old man. "And you will forget still more!" "I don't want to forget," cried Peter, "I don't want to!" The old man leaned over and touched Peter's forehead with his finger. It was a pleasant touch, cool and soothing. "Of course you must forget," he said kindly. "You must make room for all the new things you have to learn." He had awakened after an unusually vivid dream to find the ship gone. And it was then, looking down into his empty hand, that he began to wonder whether the others were right. Perhaps there never had been a magic ship after all, perhaps nobody had ever promised a gift in exchange. Maybe. Maybe not. But whether the old man really gave them a gift or whether he didn't, all of them were happy and successful for the rest of their lives. And every one who know Peter and Sheila and Humphrey and Sandy when they were grown-up called them The Lucky Grants. So there does seem to be something in it after all.